Help Guide VOL.1 has arrived! 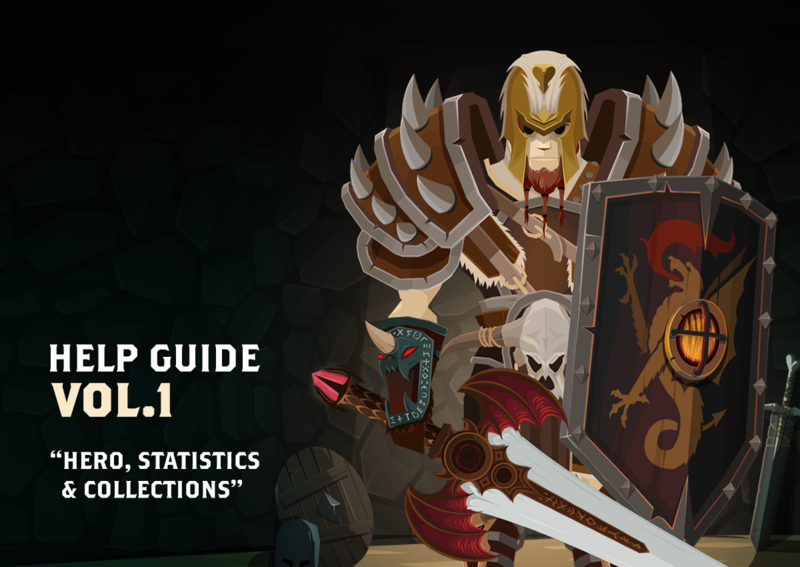 Here you can find out more information about the basics stats and metrics regarding your hero. Basic hero’s metric. Determines max possible upgrade level of Orbs and Gear. Also, certain features of the game have level requirements. Attack – increases damage you deal with Melee Attack. Defense – reduces melee damage taken by you. If opponent’s attack is lower or equal to your defense, you won’t take any damage! Sum of all your Statistics. Doesn’t really do anything, but it is an easy way to compare heroes. Keep in mind, that it doesn’t necessarily mean, that hero with higher Hero Power will win – proportions between the statistics really matter. Battling in Campaign costs energy – 1 energy point per fight. Energy restores by itself (at rate 1 point per 30 min.) up to the limit of 30. 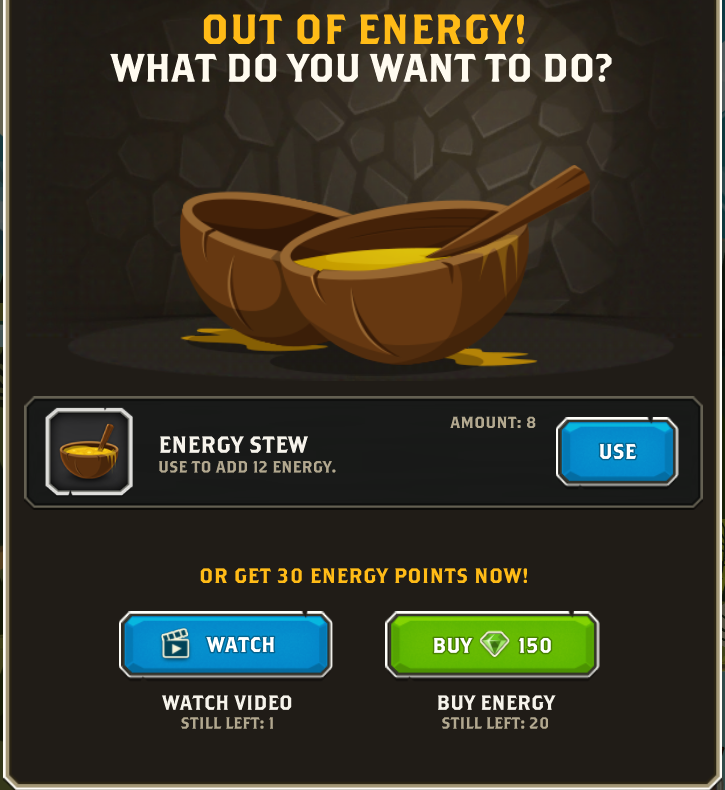 Energy can be also restored by using Energy Stew, purchasing it, getting a free stew in the Tavern, or watching an ad. 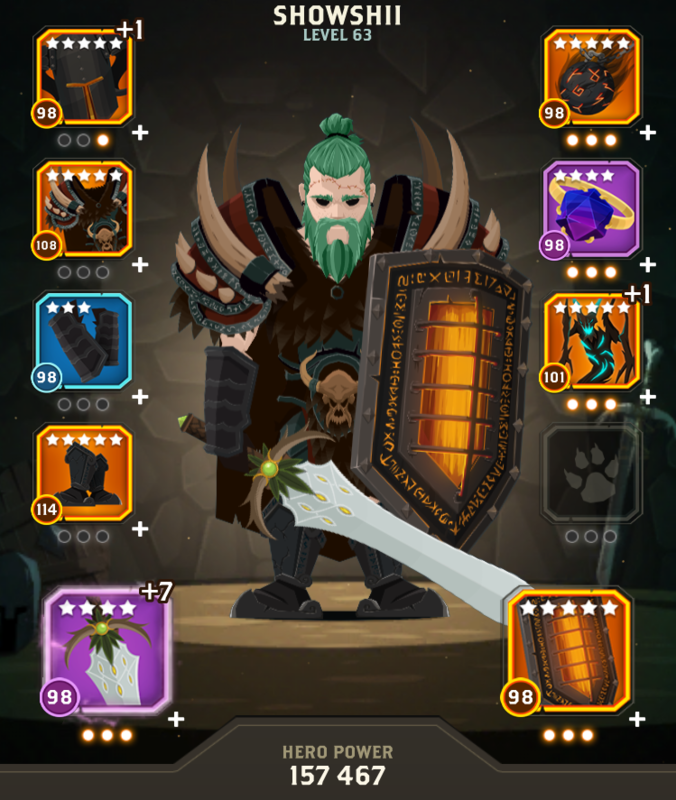 The hero has 9 slots in which you can equip Gear (Helmet, Armor, Gloves, Boots, Main Hand, Off Hand, Talisman, Ring, Pendant). If a piece of gear is already equipped in the slot, you may now also dock 3 Orbs into this particular piece: Health Orb, Attack Orb and Defense Orb. The Items tab contains everything that is not Gear, Gear Part or an Orb. This includes: Currencies, Giftboxes (items that you can open to get something), Lockboxes (a Giftbox that requires a Lockpick to open) and others. There are 2 types of Collections, both doing the same thing: increasing statistics of EACH equipped gear. Each collection has 10 slots. Each slot in the Collection increases one, particular statistic. When a piece of gear is docked into a Collection slot, statistics of ALL EQUIPPED PIECES OF GEAR are increased by the the percentage (depending on a slot) of gear statistic in this particular slot. 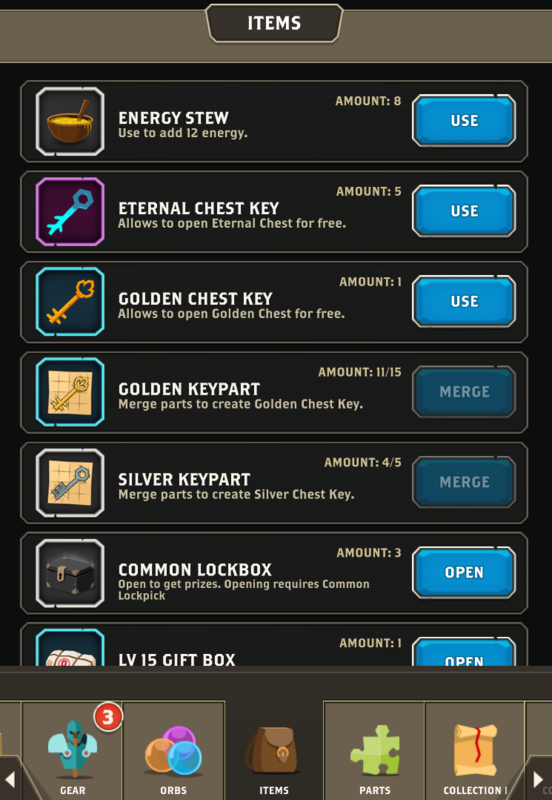 Unlocking slots requires reaching required Hero level (different for each slot) and paying 5 Collections Scrolls (either Collection Scroll for 1st collection, or Collection Scroll II for 2nd collection). 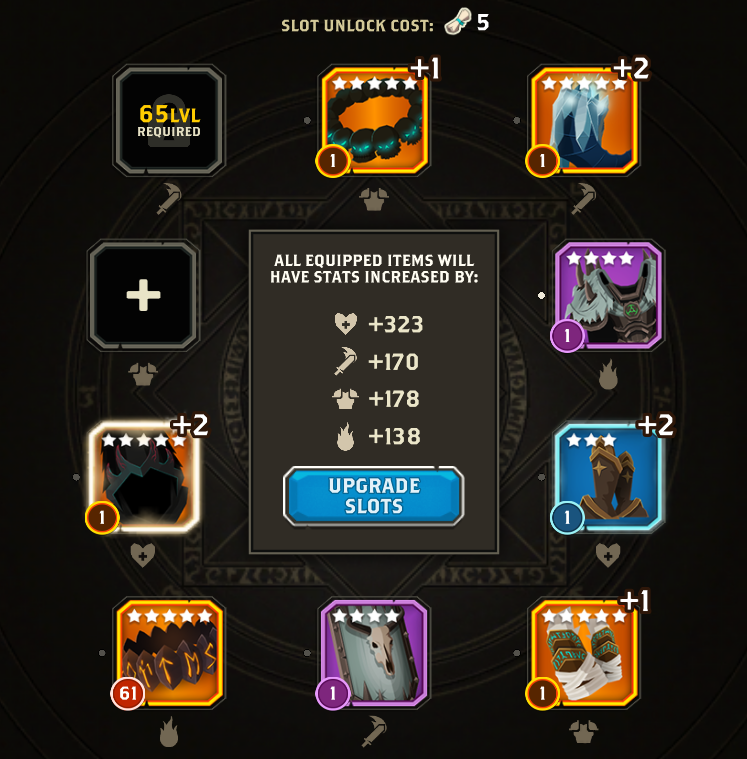 After unlocking, the slot it can be upgraded using Scrolls. 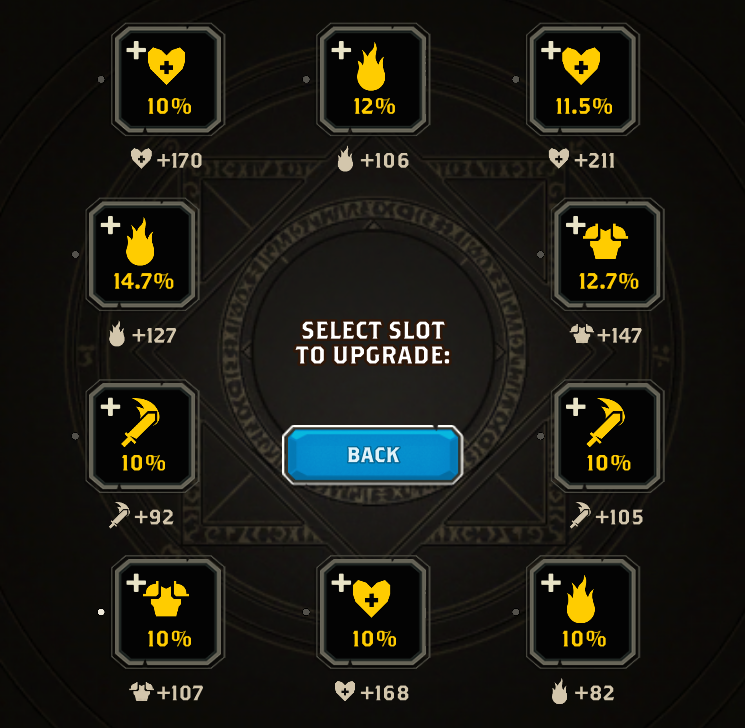 Upgraded slot gives higher percentage of statistic. Gear put in collections should be on upgrade level 1. If it’s not the case, its statistics will be reduced, as if this piece of gear was level 1, and its reforge will not be taken into account. If you want to lower gear’s level use Divide. Statistics of gear in Collections are affected by its bonuses and (if gear is on upgrade level 1) reforge. 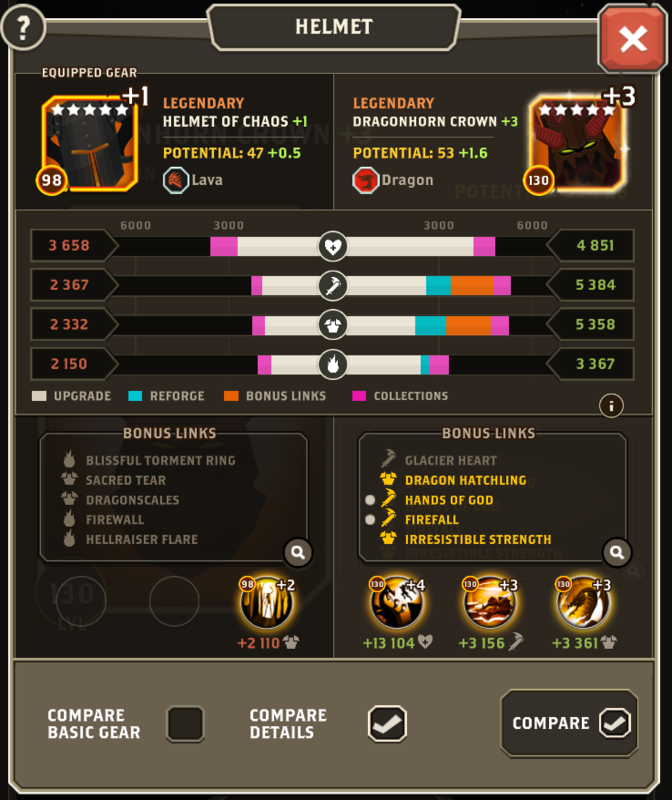 All gear in collections is considered as equipped when it comes to Bonuses. Little white dot (next to gear equipped in the Collection) means that the gear is required in one of the active Bonus Links.